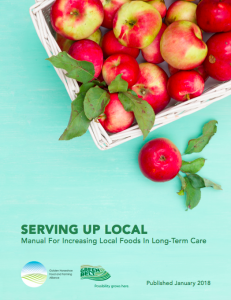 On March 18th, the Ontario Government announced the final goal of the Local Food Act, with a focus on efforts to “remove red tape barriers” for getting local food in the broader public sector, so organizations like colleges, universities, hospitals and municipalities can more easily procure local food. The Minister of Agriculture, Food and Rural Affairs, Ernie Hardeman, made the announcement at Gordon FoodService in Milton. The province announced a number of tools to help farmers, food distributors and public sector organizations put more Ontario food on our plates. Among the great list of tools and resources is our successful Serving Up Local project, where we worked with nine municipally-run long-term care (LTC) homes in Durham Region, Halton Region and the City of Hamilton, increasing local food procurement in these LTC homes by a combined 23% in 2017. You can learn more about that on our website here, where you can also access our case studies and toolkits from the project. The GHFFA welcomes this announcement to bring more local food into the broader public sector, and we are both well-prepared and eager to offer support with these efforts!